Are you a nervous dental patient? If you are, you are far from alone. It’s estimated that as many as 75% of American adults experience some degree of dental fear, with 5-10% suffering from dental phobia – meaning they avoid any sort of dental care at all costs. As the connection between dental health and overall health has become accepted as fact in the medical and dental communities, the popularity of sedation dentistry as a treatment solution for those who dread the dentist has also increased in popularity. There are many reasons to avoid the dentist, all of them valid. Money. Time. Anxiety. Fear of pain. The problem is that avoiding the dentist in the present increases the possibility for more severe (and expensive) dental problems in the future. Research also shows that there are more health reasons to see the dentist regularly now than ever before. It’s not just about strong teeth and bones anymore – it’s about oral cancer screening, prevention of heart attack and stroke, and other health and wellness issues. 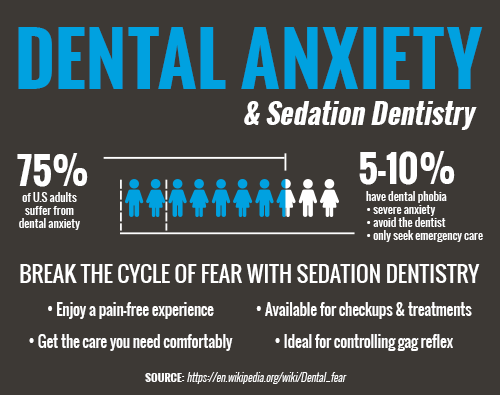 Sedation dentistry isn’t about getting a patient in the chair and knocking them unconscious, a concept that could cause severe dental anxiety in a person with no fear of the dentist at all! Sedation is different than anesthesia. Anesthesia which blocks nerves or puts you in a deep enough sleep to require outside assistance to breathe. Sedation controls pain, calms you, and helps you relax into a waking, dreamlike state – sleepy but still conscious, able to respond to the dentist and team, and to breathe on your own. Sedation does produce some amnesiac feelings, so your appointment will be over before you know it. Sedation is routinely used for extraction of wisdom teeth and other types of oral surgery. For patients with a high tolerance to anesthesia, soreness of the jaw, or strong gag reflexes, sedation can assist both the patient and the dentist. Sedation can also allow for the completion of extensive dental work using less time and fewer appointments while you remain comfortable. Your dentist will choose the most appropriate medication based on your health history and the procedure being done. A dentist may choose to give a combination of more than one sedation method depending on the situation. If you choose sedation for an upcoming dental appointment, be sure to have a ride home arranged ahead of time to keep you safe. Dress comfortably, avoiding tight-fitting clothes and contact lenses. If you have any questions about sedation dentistry or you’re ready to schedule a visit with your Bedford sedation dentist, Dr. Beelman at Beelman Dental, give us a call today or request an appointment easily online below!